Herbie came into RSPCA Walsall care as a neglected little bunny. He is extremely underweight and he was very nervous on arrival. He had been kept outside in a coal house with no natural daylight so wasn’t used to human contact. He is a black and white Dutch cross Lionhead and is 8 months old. Herbie had to have a dental due to the poor diet and lack of hay while he was growing. We are hopeful that with a good diet now he will not need a dental again, but only time will tell. Herbie’s confidence is coming on leaps and bounds. He is really coming out of his shell and showing us what a lovely little boy he is. He is a very friendly boy and likes a fuss. Herbie will be neutered shortly and is already vaccinated. We are looking to rehome Herbie with a neutered female bunny for company. If you feel you can offer Herbie his forever home, please contact RSPCA Walsall on 0845 272 3570 or email us at enquiries@rspca-walsall.org.uk. Our branch is run by volunteers so please be patient. 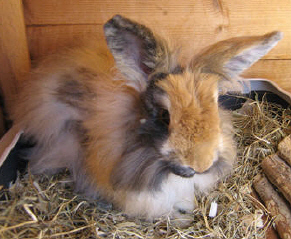 Dozer (ref 34m) is an adult rabbit Lionhead, possibly cross who is looking for a new home. Flopsy is a lovely 1 year old female Lionhead cross. She is a very friendly girl and is able to live with another rabbit. For further details, please contact MGFT Animal Sanctuary’s Lincoln Farm branch in Dorset on 01929 471340. Buttons is a very handsome small ginger/dark grey buck. He’s a very friendly little boy looking for a new home. Thumper is too pretty to be a boy! He is a 1 year old Lion Head cross, hence the fluffy coat. Thankfully he is not difficult to keep clean, and a quick trim once a month or so is all he would need to keep his fur looking nice. He has recently been neutered.